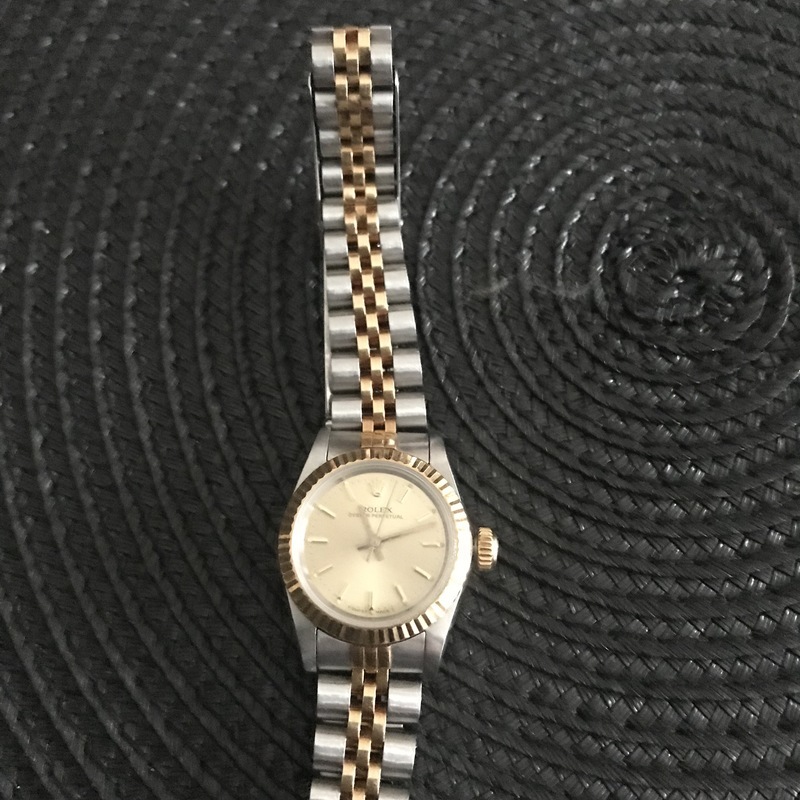 Thank you for sending in your ladies Rolex wristwatch to mearto for a fair market appraisal. I will try to assist you with that today. Not accompanied by a fitted box and booklets. Case – 25mm diameter, three leaf, polished and brushed stainless steel and 18k yellow gold, screwed-down case back and screwed-down case gold crown, fixed fluted gold bezel, sapphire crystal, all integrated with a stainless steel and 18K yellow gold Rolex Jubilee bracelet. . . Dial: Gilt dial with applied yellow gold baton hour indices each with luminous dot, open bar outer minute/seconds track. Luminous yellow gold baton hands and counterbalanced center seconds gilt pointer. No date on this model. The dial is marked, “Rolex, Oyster Perpetual, Superlative Chronometer, Officially Certified” while below “T-Swiss made-T”. . .
Movement – NOT SHOWN but thought to be the Rolex Cal. 2130, a rhodium-plated, stippled perlage decorated plates, 29 jewels, straight-line lever escapement, monometallic balance adjusted to temperatures and 5 positions, free-sprung self-compensating flat balance spring, hack mechanism with dial, case and movement triple signed. . .